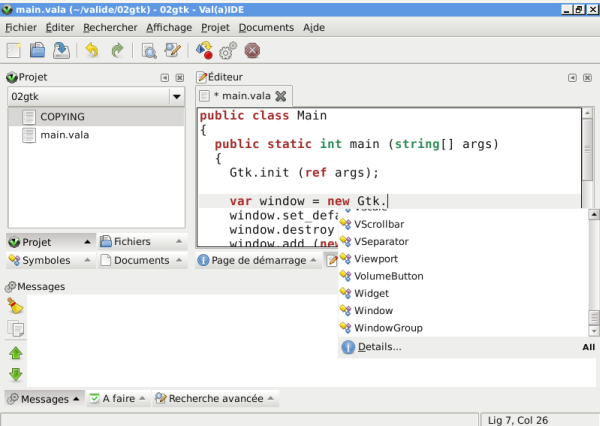 Val(a)IDE is an integrated development environment (IDE) for the Vala language . The software is itself written in Vala. Initially developed by Nicolas Joseph and Yu Feng, the project stayed quiet for a little more than two years. I took over development to fix bugs and add some functionalities. - Autocompletion now works on Windows, too. - migrate to GTK+ 3. Cool! I'll give it a try next week. Thanks for the effort. PS : I'm looking for feedback, especially bad one, so feel free to drop any observations here. Is there any plan also to support .gs file beside .vala files (as valac drives this syntax, too) ? As I can see from some mailing list archives, there is an experimental syntax highlighting support, which I could easily integrate in the next release. I just won't have enough time to integrate autocompletion in this one, though :-(. But I can add it to the long-term roadmap. It should have a outline function. I suppose the IDE is too simple to use. It should have some more features as outline, auto complete, etc. I suppose you can reference to codelite or codeblock. I don't like anjuta because it often core dump when I was modifying my code. I also hope this project can become a plugin of codeblock or codelite supporting vala. Some features are WIP and shown here ; auto-complete will be ...complete, for outlines I have to check. It may not compete with Anjuta and friends, but it has its own plugin system, and source is GPL, so everybody is welcome. I doubt I will write plugins for other IDEs myself, though.